And Chef Sarah Bonar is a float-whisperer. It's a thing. The little girl was about four, she guessed. Perched at the counter of San Francisco’s Frances on an evening in early spring, flanked by her parents, her eyes locked on the final course of the night: a strawberries and cream float. A double-whammy of Albion strawberry sorbet and vanilla ice cream, topped with a stream of house strawberry soda. "I really do love all desserts, but I think the nostalgia factory definitely puts floats at the top of my list,” she continues. “I like that they can be light and refreshing, so even after a long and filling meal, you can order a float and not feel like you’ve completely overindulged." With that in mind, Bonar errs on the fruity side when constructing a float, including it both fresh and in sorbet or ice cream form. “The fruit lends acidity and freshness, which is so important for all desserts so they don’t become complete sugar bombs,” she explains. 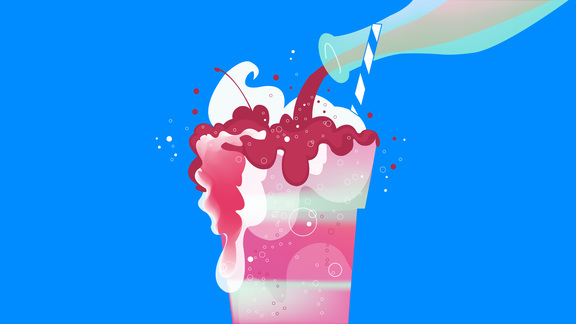 Soda morphs into a purer vision of the drink: fruit scraps stew for a bit in a batch of simple syrup, then get topped off with sparkling water. Some floats get a hit of Champagne instead. She almost always includes fresh herbs to give her concoctions a little boost of the unexpected; blueberries and basil can be found on the menu at Frances's sister restaurant Octavia, where Concord grape and tarragon appeared last summer. The rule of thumb she applies to all desserts also applies to floats: Pick a few key ingredients and highlight them without getting too complicated. “Too many flavors in a dish results in a really sad party in your mouth,” she says. Cool, so: we don't want to get carried away, but this place may actually be heaven on Earth for the sweet of tooth. They've got classic floats, they've got seasonal floats, they've got build-your-own-damn-floats. Every flavor you cherished in your childhood appears here in float-form (which, dare we say, may blow the originals out of the water)—Push Pops, Orange Creamsicles, the works. Personally, we'd snag the Hula Hula (Waialua Lilikoi soda with macadamia nut ice cream, and whipped cream) or the Horchatte (Boylan Creme Soda, horchata ice cream, whipped cream, and espresso). This one's for the classicists out there: as a loving homage to the soda fountains of the past, The Franklin Fountain revels in the details. There's old-fashioned egg creams, milkshakes, and splits; the staff sports bow-ties and accept cash, not cards. Everything is made from scratch, in a loyal recreation of the original shop experience of yore. The introduction of ice cream to soda, its website informs you, first occurred in 1874 Philadephia, by a genius named Robert M. Green—we think he'd be fond of this menu, stacked with creations like the Cherry Bomb (bittersweet chocolate ice cream dropped into a house-mixed, tartly sweet cherry soda) and the Wiener Eiskaffee (cold-brew coffee with a scoop of vanilla bean ice cream, whipped cream, and chocolate syrup), a Viennese coffee house indulgence. If you've got balls, this NYC staple purports, you'll order your float with whiskey, not soda. With seven locations and counting, you can pretty much guarantee a float fix wherever you are. Chef Daniel Holzman and crew stick mainly to the classics — root beer, cream soda, or Coca-Cola — but keep an eye out for special ice cream flavors, and add a shot of iced coffee if you need a buzz (but say, less of a buzz than whiskey). Where do you get your float on?? Show us on Instagram with #chefsfeed. And other meditations on leadership from Aaron Hoskins of Birds & Bubbles. If you thought the holy trinity of graham, marshmallow, and chocolate couldn't be improved—step into the light. In a twist literally everyone saw coming, no one said candy corn.